Vintage Licks Guitars has built a reputation for selling guitars that are professionally set up for accomplished players to get the best possible sound and feel. Our customers include record producers, recording engineers, touring musicians, well known singer song writers and many other musical artists and enthusiasts. Every instrument at Vintage Licks Guitars must meet the standards of these demanding professionals, even though many of our buyers just play at home for their own enjoyment. To obtain the best results we rely on the collective experience of trusted luthiers, feedback from professionals who demo the instruments, and from our own hands-on knowledge from a lifetime of owning, playing, inspecting and researching vintage guitars. Having access to such talented repairmen makes all the difference. With vintage guitars we understand our duty to preserve and repair as conservatively as possible. Our goal is always to maintain originality while ensuring the structural integrity of the guitar and the correct geometry for a proper setup. Our process starts with a thorough external & internal inspection, independently and with the luthier. We establish a plan for repair, and maintain in-person communication to check progress and make key decisions. Upon completion, we inspect the guitar again, get feedback from our demo players, and make final adjustments if needed. We put the effort, time and expense into making certain our guitars are repaired correctly and play great so you don’t have to. In the guitar descriptions, you will see some terms used to describe repairs. If these terms are not familiar, you can find additional information on our preferred approach below. One of the most common and most necessary repairs for a vintage guitar. Many old guitars found with high unplayable action and a neck reset is necessary to correct the neck angle and bring the action back to factory specification. Properly performed, a neck set has no effect on a guitar’s originality and will actually enhance its value by restoring proper playability. Some guitars require a thin wooden shim under the end of the fingerboard extension to play the highest frets, when performed properly this is of no consequence as well. The hide glue used to hold together vintage guitars naturally breaks down over time. The internal braces can come loose, usually at the ends. Gluing them back in place correctly will restore the proper stiffness of the top or back to enhance the sound and ensure structural integrity. The bridge and bridge plate also support the top of the guitar and a proper glue joint ensures the best sound characteristics. Another common repair for vintage guitars, often from exposure to dry conditions. Our approach is to properly humidify the guitar before cleaning, aligning, and gluing any cracks. Many old guitars will have some cracks but when properly repaired they present no problem for tone or structure. Distance between the fret top and string bottom, measured at the 12th fret, usually expressed in 32nds of an inch. For example, 3/2 action would be shorthand for 3/32″ on the low E string and 2/32″ on the high E string. Action can fluctuate slightly with climate and season depending on your location. Most vintage acoustic guitars no longer have their original bridge pins, or they are worn beyond use and plastic tuner buttons can deteriorate and crumble. Our friends at Antique Acoustics in Germany supply high quality vintage replica bridge pins and tuner buttons. Precisely made from harder material that will hold its shape, these pins are better than the originals and look correct. The best choice when replacements are needed. When required, we use these exclusively on our vintage Martin and Gibson guitars. 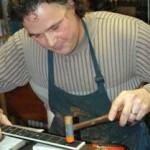 These trusted craftsmen perform the work for Vintage Licks Guitars and each own and operate reputable repair shops. Direct contact info is listed for each of these talented gentlemen. Ross has a long established reputation within the vintage community. Auction houses and high end collectors rely on Ross’s expertise to expertly repair rare & valuable vintage instruments. He is right at home restoring and repairing the vintage flat top guitars we specialize in. Ross’s approach is better described as “conservation” rather than simply repair. He is also well-known as a builder of his own innovative and original designed electric, acoustic and bass guitars. Teigen Guitars maintains a very active shop in Hawthorne, Florida near Gainesville. Pat DiBurro is a busy factory authorized repairman for Martin and Taylor guitars with over 30 years experience. Collings guitars refers their complex out-of-warranty work to Pat’s shop based on his reputation for excellent results. 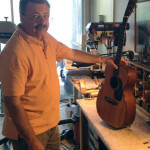 Pat excels in restoring vintage acoustic guitars. 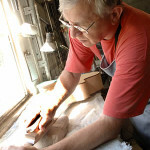 His diverse skill set includes complex finish work. He is a long time member of ASIA and lives and breathes his profession. David is a skilled professional luthier who builds guitars of his own design and has worked on many vintage guitars featured on my site. He has vast experience working on 1930’s and Banner era Gibson guitars and is a factory authorized Martin repairman. One of his main strengths is fretwork and setup, and many guitars that he has worked on are now in the hands of professional musicians. David performs all types of repair and lutherie work out of his shop, including working on electric guitars, his own builds, and various warranty repairs. David is a knowledgeable Gibson aficionado and collector player himself.